On Estate of a Deceased Person. In law the rights which a person has to recover money or things of value from others, whether by contract or for wrongs sustained. In the Bible is applied to the debit as well as to the credit. The Mishnah, when speaking of demands as a kind of property, generally names ("bonds") as being the most valuable; and a single demand is often called ("a loan"). The incidents of demands are these: (1) Can they be transferred? If so, how and with what effect? (2) To whom do they pass at the owner's death? Do they survive him? (3) Do they survive against the debtor's or wrong-doer's heirs? (4) How are they extinguished without satisfaction? 1. The first question is answered under Alienation. It may be added that though the sages have found means to bring about the transfer of contractual demands, the Talmud nowhere alludes to the assignment of claims arising from torts to either person or property. Where the demand savors of tort, an attorney to bring suit ("mursheh") could not be appointed, even in later times, when the leave to appoint attorneys had been extended; for the letter of attorney took the form of a partial assignment. The claim for an admitted deposit could be assigned, the thing deposited itself being assigned (B. Ḳ. 70a; "Yad," Sheluḥin, iii. 6, 7; Shulḥan 'Aruk, Ḥoshen Mishpaṭ, 123, 1). 2. At the owner's death his estate, both landed and movable, together with his demands, goes to his heirs; and they may sue for and collect all demands. The debtor, or person bound by a wrongful act, must pay them. This applies to the value of goods taken by force or embezzlement, and to the one-fifth in addition due under some circumstances by way of atonement (B. Ḳ. ix. 5), and to the double or greater compensation due by the thief or faithless depositary ("Yad," Genebah, ii. 6). Likewise the party who has made himself liable for injury to property must, if the owner die before recovery of damages, pay his heirs, as the injured person is considered in the light of a creditor ("Yad," Nizḳe Mamon, viii. 11). 3. It has been shown under the head of Debts of Decedents how far the assets left by a debtor are subjected to his obligations. It is shown under Robbery how such assets are liable for the value of goods taken by force. They would in like manner be bound for the single value of goods stolen; also for all damages to property, whether done wilfully or by negligence (ib. viii. 11, 12). Neither Talmud nor either of the codes mentions the liability of heirs for injuries to the person committed by their ancestor; but it may be inferred, from the enumeration of the differences between injuries to property and injuries to the person (B. Ḳ. viii. 7; "Yad," Ḥobel, v. 9, 11), in which there is no mention of injuries arising from the death of the wrong-doer, that here also the heirs are bound to the extent of assets left.As shown under Debts of Decedents, the procedure against the heirs is clogged with many hindrances; but, in theory, it seems that all demands survive against the heirs of the party under obligation. 4. A demand can not be extinguished by mere lapse of time. There is no statute of limitations, except the Scriptural law of the year of release, which was never in force outside the Holy Land, and even there was practically abrogated in the days of Hillel. The Ḥazaḳah is nothing but a presumption arising from lapse of time, always subject to rebuttal. Any demand may, however, be extinguished by a voluntary release ( ); and, as a rule, this act does not need a formal transfer of title ( ), though in many places it was customary to clothe it in such forms ("Yad," Mekirah, v. 11, 12). 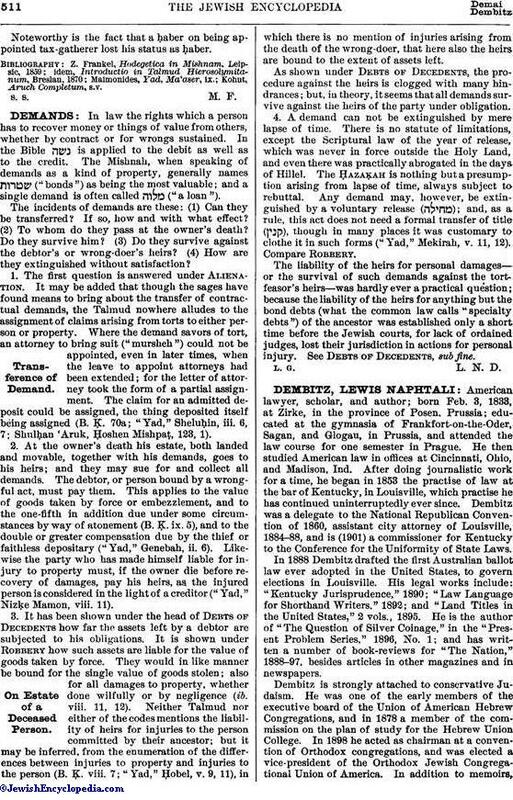 Compare Robbery.The liability of the heirs for personal damages—or the survival of such demands against the tortfeasor's heirs—was hardly ever a practical question; because the liability of the heirs for anything but the bond debts (what the common law calls "specialty debts") of the ancestor was established only a short time before the Jewish courts, for lack of ordained judges, lost their jurisdiction in actions for personal injury. See Debts of Decedents, sub fine. L. G. L. N. D.